Cal Mag 63 and 82 contain two high quality sources of both, Calcium, and Magnesium. Choose the ratio that compliments your site specifics to promote optimum plant health. The right product and application rate should be determined based on irrigation water quality, Ca/Mg ratio, content, time of year, and/or availability of Calcium and Magnesium in the soil solution. These products are so versatile; they can be applied as a foliar, or lightly watered in for root uptake. 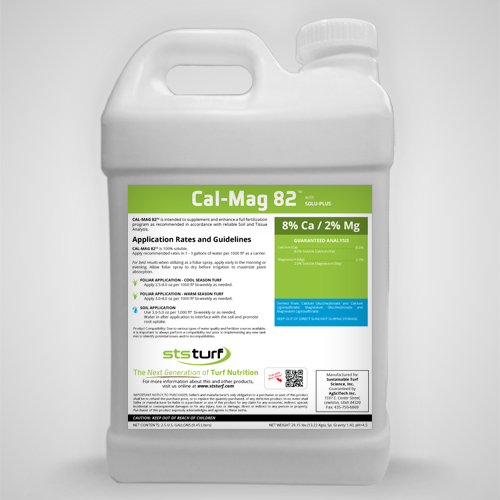 Combine Cal Mag 63 or 82 with one of our STS seasonal products to form a complete nutrient package, delivering all essential elements simultaneously using just two products! Our organic surfactants and proprietary pre-digestion processes provide low molecular weight complexing and chelating agents that stop the electro-magnetic attraction between positive and negative charged elements, this maintains nutrient availability, enhances turf absorption, and root uptake. Multiple vitamins, enzymes, and organic acids compliment our Calcium and Magnesium to conserve plant energy, maximize product utility, and extend plant health benefits. Injection/Fertigation Rate / Acre 1.0 - 3.0 qts.